The widespread practice of female foeticide and infanticide in Rajasthan is one form of violence against women that proves the drastically lower value of girls in this society. On October 20th, young women from the Bavadi and Corana villages of Aahor block in Jalor district demonstrated their commitment to ending this early form of discrimination and addressing their community's attitude towards women. 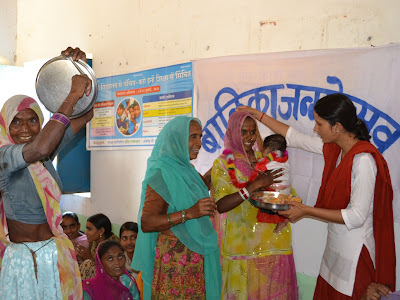 To do so, the adolescent girls group comprised of young women from these two villages organized a celebration of the recent births of five local baby girls, sending the message that these births are just as special and valuable as the births of sons. This birth celebration in Bavadi was inspired by a similar celebration held in Kotara village by the local Vikalp adolescent girls group. The Kotara group had a difficult time finding a location to hold their meetings due to strong customs regulating the interaction of women from different classes. Despite threats from the Sarpanch and Charan community that the participating women and their families would be expelled from the village, the group continued to hold meetings in a Krishna temple. It was during one of these meetings that the women discussed the recent birth of three girls in the village and why these births are not treated with the same happiness as boy child births. Therefore, the group of young women arranged a rally to call attention to this issue. Women were called from all different castes and communities to bring sweets and flowers for the baby girls and play the thali as they would for a boy's birth celebration. Afterward the group went around to different homes to talk about the state of women in the community. When girls from Bavadi and other villages learned of this birth celebration at a Vikalp conference for rural girls empowerment held in Udaipur, they decided to start the same type of celebrations in their own communities. The celebration itself was a joyful affair as more than 50 girls and women from Bavadi and surrounding villages packed into the large room used for panchayat meetings in order to welcome the five baby girls into the world. One by one, each mother was given a garland and, along with the baby girl, a tilak and a sweet. Afterward a woman was chosen, often a relative of the newborn, to bang the thali amidst cheers from the whole room. In this way, each baby girl was celebrated as a valued addition to the community. Afterward there was a naming ceremony, during which the baby girls were each given a name by a member of the adolescent girls group, who had prepared decorative signs for the occasion. 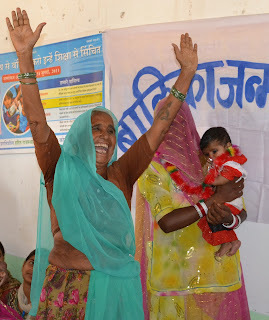 The mothers of the baby girls expressed happiness throughout the celebration, noting the changes in their community since being involved with Vikalp. One mother explained how in the past girls were not seen as a "good investment" since, unlike boys who will earn money and carry on the family name, daughters need to be fed and kept safe before leaving altogether for another house. 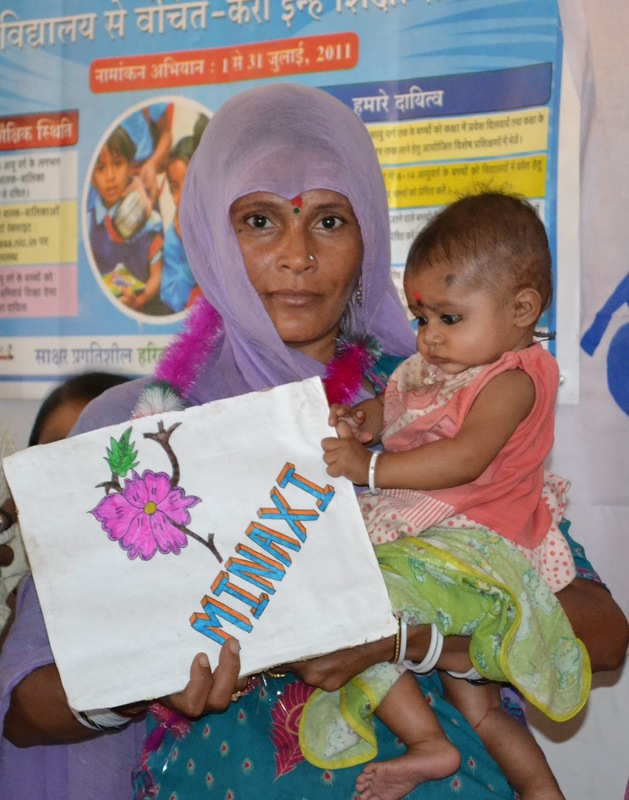 With the help of Uma ji and other Vikalp staff and volunteers, she has come to see that a daughter must be valued equally and provided with good education that will be useful in her life after marriage. She explained that the babies' fathers and the rest of the community are also beginning to change their opinions and value the birth of a daughter. The other mothers added that they will all continue to celebrate the birth of other girl children and talk to each family about the blessings of having a daughter. In this way, they will ensure that girls will be more respected in their community. Great initiative! I guess this is how new and empowering traditions would be taken forward by youth themselves. Congratulations to the entire team! I agree, great initiative. And it is so encouraging to see how the actions of groups of brave young women can spread and effect similar action in other parts of the region. Positive energy and action is contagious!